Ownership / Access: Local authority. Open to public. Notes: Lancaster Castle is a medieval castle in Lancaster in the English county of Lancashire. Its early history is unclear, but may have been founded in the 11th century on the site of a Roman fort overlooking a crossing of the River Lune. 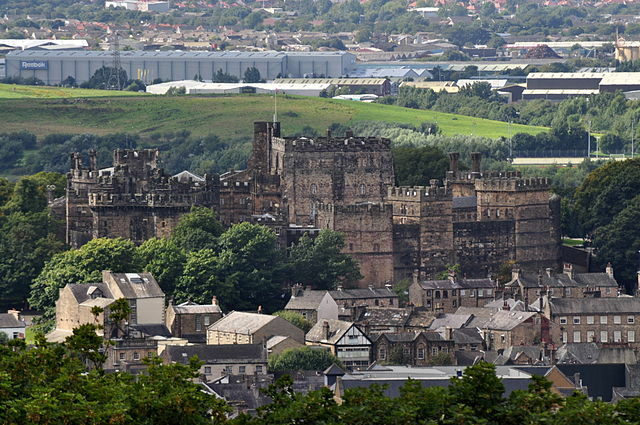 In 1164, the Honour of Lancaster, including the castle, came under royal control. In 1322 and 1389 the Scots invaded England, progressing as far as Lancaster and damaging the castle. It was not to see military action again until the English Civil War. The castle was first used as a prison in 1196 although this aspect became more important during the English Civil War. The castle buildings are owned by the Duchy of Lancaster, which leases part of the structure to Lancashire County Council who operate a Crown Court in part of the building. Until 2011,the majority of the buildings were leased to the Ministry of Justice (United Kingdom) as Her Majesty's Prison Lancaster. The Castle was returned to the Duchy's ownership by the Ministry of Justice in 2011.In 79 AD, a Roman fort was built at Lancaster on a hill commanding a crossing over the River Lune. Little is known about Lancaster between the end of the Roman occupation of England in the early 5th century and the Norman Conquest in the late 11th century. The layout of the town was influenced by the Roman fort and the associated civilian settlement; the main road through the town was the route that led east from the fort.After the Norman Conquest in the second half of the 11th century, Lancaster was part of the Earldom of Northumbria; it was claimed by the kings of England and Scotland. In 1092, William II established a permanent border with Scotland further to the north by capturing Carlisle. Lancaster castle still has a bin from the Roman times on site. It is generally thought that Lancaster Castle was founded in the 1090s on the site of the Roman fort in a strategic location. The castle is the oldest standing building in Lancaster and one of the most important. The history of the structure is uncertain. This is partly due to its former use as a prison, which has prevented extensive archaeological investigation.